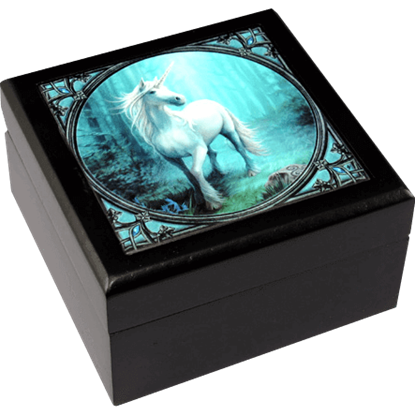 Based on the lovely fantasy art of Linda M. Jones, the Black Magic Unicorn Trinket Box displays the shadowy head of a dark unicorn with gleaming sparks of light radiating from the glowing tip of its magical horn. 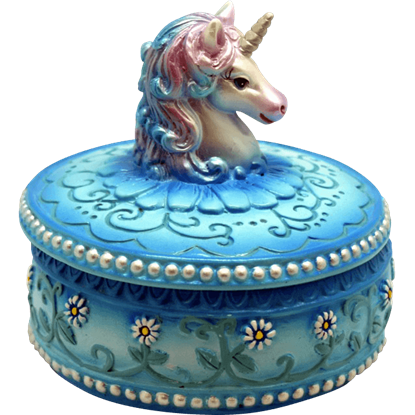 Designed to look like a unicorn sticking its head up out of a pool of water, the Blue Unicorn Trinket Box features a pearlescent unicorn's head on the lid, while the base of the box is decorated with images of daisies and vines. A beautiful maiden leads her unicorn friend forward as they travel through a forest realm of wonder. 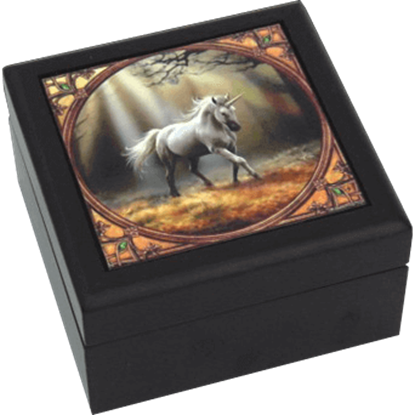 The Enchanted Unicorn Tile Box showcases this fantasy scene from the work of Anne Stokes on the square tile inset upon its lid. As guardian of an enchanted glen, this unicorn is perfectly suited to keep watch over your trinkets and knickknacks. 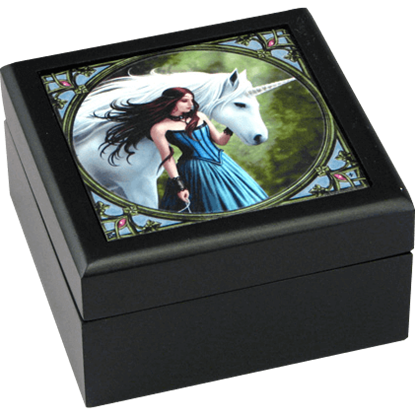 The Forest Unicorn Tile Box reveals the creatures magical realm on its lid, based on the art of Anne Stokes. Count yourself lucky, as you may have spotted the rarest creature in all the forest. 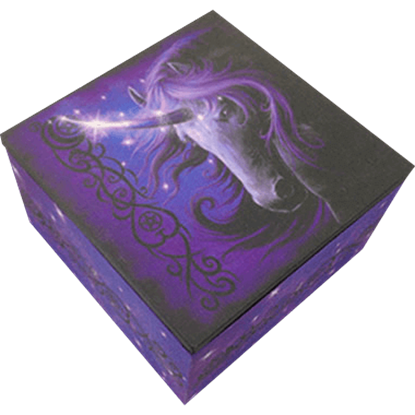 The Glimpse of a Unicorn Tile Box presents one of the most magnificent and elusive creatures of fantasy gracing the tile top of its wooden lid. Nothing is purer than the love of a parent for a child. 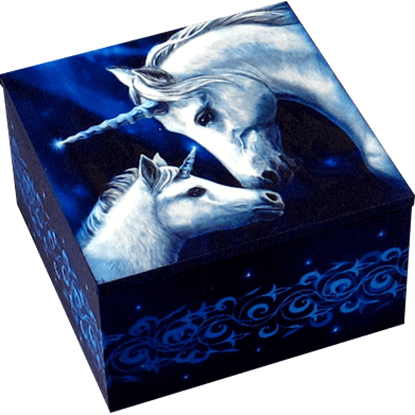 The Lisa Parker Sacred Love Unicorn Box offers a glimpse into a tender moment between a sweet white unicorn and its young, based on the fantasy artwork of Lisa Parker. 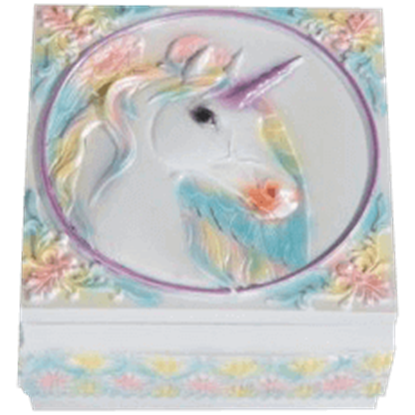 Keep your favorite jewelry neatly stored in style with the Pastel Unicorn Trinket Box. The lid of this fantasy collectible features a portrait of a white unicorn with rainbow hair and wings surrounded by ornate rainbow flower details. I would just like to thank you all at Dark Knight Armoury. I have received my Assassin's armor and it is a perfect match for what I wanted. Though the order needed to be changed, you were very helpful and friendly. I look forward to doing business with you again.